Every Tuesday Diane at Bibliophile by the Sea hosts First Chapter First Paragraph Tuesday Intros to share the first paragraph sometimes two, of a book that she’s reading or planning to read soon. 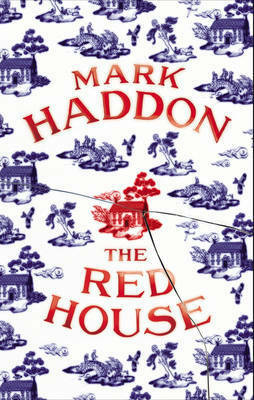 This week I’m featuring The Red House by Mark Haddon. Cooling towers and sewage farms. Finstock, Charlbury, Ascott-under-Wychwood. Seventy miles per hour, the train unzips the fields. Two gun-grey lines beside the river’s meander. Flashes of sun on the hammered metal. Something of the steam about it, even now. Hogwarts and Adlestrop. The night mail crossing the border. Cheyenne sweeping down from the ridge. Delta blues from the boxcar. Somewhere those secret points that might just switch and send you curving into a world of uniformed porters and great aunts and summers at the lake. I was struck by the imagery of the train unzipping the fields and the mix of different train journeys, with the hint of nostalgia and the promise of something unknown about to happen. And I like the cover – the small black illustrations against the white background and the black lines meeting at the red house. After his mother’s death, Richard, a newly remarried hospital consultant, decides to build bridges with his estranged sister, inviting Angela and her family for a week in a rented house on the Welsh border. Four adults and four children, a single family and all of them strangers. Seven days of shared meals, log fires, card games and wet walks. But in the quiet and stillness of the valley, ghosts begin to rise up. The parents Richard thought he had. The parents Angela thought she had. Past and present lovers. Friends, enemies, victims, saviours. And watching over all of them from high on the dark hill, Karen, Angela’s stillborn daughter. The Red House is about the extraordinariness of the ordinary, weaving the words and thoughts of the eight characters together with those fainter, stranger voices – of books and letters and music, of the dead who once inhabited these rooms, of the ageing house itself and the landscape in which it sits. Once again Mark Haddon, bestselling author of The Curious Incident ofthe Dog in the Night-time and A Spot of Bother, has written a novel that is funny, poignant and deeply insightful about human lives. What do you think – would you read on or not? I like all that descriptive language in the first paragraph. It feels as if I am right there, seeing it. I like the introduction of this and the description. However, I think I’m one of the only people on the planet who didn’t like The Curious Incident… so I’m not sure. I might wait for your review. I’d definitely read on, Margaret. I like Haddon’s work very much. And the story sounds engaging. I like this author but for some reason I don’t recall reading this book –I’d read more. I like the way the author constructed the opening – short sentences that create tension. Great word pictures (unzips the fields) with glimpses of views from fast-moving trains. Beautiful! I would definitely read on. I’ve been wanting to read this book for a while and you’ve just encouraged me even more! Oh, yes! I agree with your thoughts on the opening. I really like the description and can just picture that train moving in my mind. I haven’t read but one book by Haddon. This one sounds good. Thank you for sharing! Ooh yes until I got to the end I was trying to recall why I knew this author’s name – thank you! I’m not quite so sure an enforced stay on the Welsh boarders with a bunch of relative strangers is my idea of fun but this definitely sound worth exploring!